A week before Thanksgiving Will decided he had to have a pair of "Don Draper PJs" to lounge in while we were in Wyoming. We had just finished watching 2 seasons of AMC's 'Mad Men' and Will had been inspired by this scene. With less than a week before our trip, I got started on Will's own pair of "DD PJs". Here's a pic of the finished project - does it look like 1962? After sewing all that piping I swore off any additional DD Pjs. Will was also quite a demanding recipient and I had to make custom pockets twice (the first one "didn't feel right"). But, I received a lovely piping foot for my sewing machine for Christmas (and I saved the final pocket pattern) so Will might be getting some "spring inspired" pajamas. As for 'Mad Men' - I would recommend you run out right now and rent Season 1 & 2 on DVD. It's set in 1962 at an ad agency in New York. It's everything you love about 'retro' - 2 martini lunches, sexism in the workplace, and real fur! 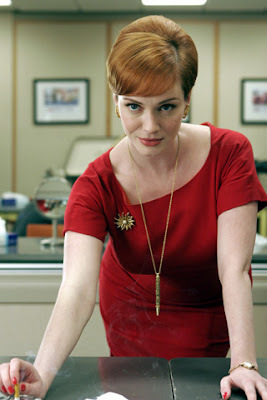 One of my favorite characters is the 'head secretary' Joan (she's very sassy!). Look like anyone you know? P.S.S. - Apparently Will isn't the only one asking - check this out! also, i like Betty best...especially when she got the shotgun out and shot the neighbor's birds. it was so Tony Soprano- like.